Boston, MA, September 8, 2017 . . . American Well announced it has opened a telehealth medical and psychological counselling practice on its consumer service, Amwell ™, devoted to the relief of people affected by Hurricanes Harvey and Irma. Medical and counselling services are rendered free of charge to people in any State that has declared a State of emergency with respect to these storms. States currently open to service on this practice include Texas, Louisiana, Florida, South Carolina, Georgia, and North Carolina – and areas of availability will be updated as Hurricane Irma progresses. For people who are still coping with the flooding and destruction aftermath of Hurricane Harvey or are evacuating to escape the threat of Irma, this service will provide on demand, live access to physicians and therapists who can help counsel individuals and families in their time of need. Before, American Well had made visits free of charge to Hurricane Harvey victims in Texas and Louisiana, and now extends these services to anyone in the Gulf region affected by these storms. Clinical services on Amwell are provided by American Well’s clinical affiliate, Online Care Group. 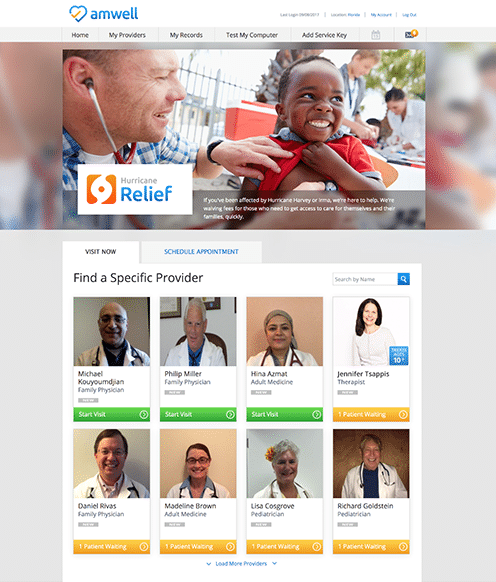 If you are a licensed healthcare provider who would like to donate services, sign up here. American Well uses telehealth to improve people’s access to quality care. Through our partnerships with the nation’s largest health systems, insurers, employers, and retailers, our award-winning telehealth Exchange and our direct-to-consumer service, Amwell™, we connect millions of Americans to the doctors they trust for live video visits. Through the power of telehealth, we help patients get the care they need in a timely fashion, and help doctors be there for their patients. We build technologies to make healthcare go where people need it most. For more on how we are changing healthcare delivery through telehealth, visit AmericanWell.com.